This is baby's moment to shine. 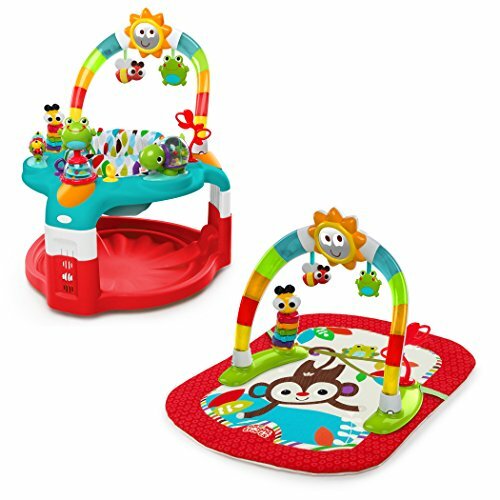 Bright Starts 2-in-1 Silly Sunburst Activity Gym and Saucer is two products in one that grow with your baby - from an activity mat to an activity saucer. This saucer has an amazing toy bar that entertains baby with a dancing light show that offers three modes: lights only (when you need a little quiet), baby-activated mode responds to baby's movements, or switch to continuous lights and music for up to 20 minutes. The light bar attaches to the play mat to become an engaging play gym, and then transfers to the activity table to become a saucer full of back yard-themed fun. The multi-colored toy bar includes 2 character toys and the cheery sun character offers a back lit mirror for self-discovery and cheeks that light up and flash to the music. The tray table offers plenty of activities to keep little hands busy, including a ladybug roller drum with fun textures and beads, a frog popper with beads that spin, a friendly turtle with beads and holographic spinning paddle, a leaf-shaped tether, and a bug-eyed bead chaser. The saucer adjusts to 3 positions to keep baby comfy as he or she grows, and the seat rotates 360 degrees so baby can easily reach every toy with ease. 4 link loops allow you to add additional toys to keep the fun going. Seat and built in storage tray are both easy to clean. This activity gym and saucer combo is packed with grow-with-me value and fun under the sun. Fun comes first. View More In Bouncers, Jumpers & Swings.